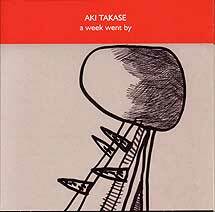 Aki Takase, piano; John Edwards, double bass (tracks 1, 2, 3, 7, 8); Tony Levin, drums (tracks 1, 2, 3, 7, 8); John Tchicai, alto saxophone (track 4). Recorded in concert at Gateshead Town Hall on 7/8 June 2008. Cover illustration (reproduced above) by Rina Donnersmarck.